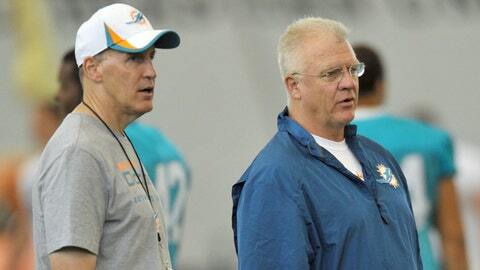 Dolphins head coach Joe Philbin (left) has known Mike Sherman (right) since 1979. Sherman taught Philbin in high school. Clean house or stay the course? Miami Dolphins owner Stephen Ross apparently opted for a compromise choice, with the team announcing the dismissal of offensive coordinator Mike Sherman on Monday. 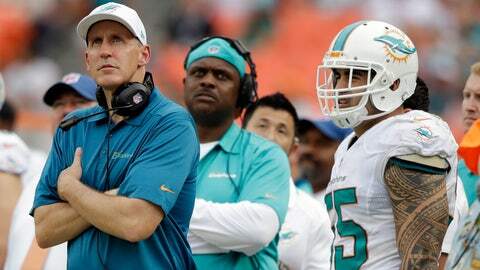 The move would seem to indicate that head coach Joe Philbin and general manager Jeff Ireland remain safe in their jobs for the 2014 season. Sherman was an easy target after free-agent signings that included receivers Mike Wallace and Brandon Gibson, tight end Dustin Keller and tackle Tyson Clabo. The acquisitions created much optimism for the offense. Yet, it wasn’t to be. The Dolphins finished 27th (312.9) in yards per game, 26th (19.8) in points per game and allowed a league-high 58 sacks. FOX Sports’ Alex Marvez reported Monday that more coaching changes were expected. Offensive line coach Jim Turner could be a goner. Besides the line’s sacks total, Turner became a secondary character in the Jonathan Martin-Richie Incognito bullying scandal. Philbin is 15-17 in two seasons as Miami’s coach with no postseason appearances. Giving him a third season seems reasonable. Ireland, however, has been the GM the past six seasons after being hired by then-executive vice president of football operations Bill Parcells. In a quiet surprise, Ross gave Ireland a contract extension through 2014 before this past season. The Dolphins won the AFC East in 2008 but have followed with mediocre records of 7-9, 7-9, 6-10, 7-9 and 8-8. Firing Philbin and retaining Ireland would further alienate a fan base that generally puts the blame for the team’s woes on the general manager. Hiring a new GM and keeping Philbin would not be ideal. Such a scenario could work, though most GMs insist on hiring their own coach. Finding a person to accept Philbin might reduce the number of viable candidates. The other option was to make coaching changes, first and foremost Sherman. Philbin, taught by Sherman in high school, undoubtedly was reluctant to fire his friend and mentor. Then again, a smart person such as Philbin knows NFL head-coaching opportunities are hard to get. Following the season, with Sherman’s job status a hot topic, people wondered if Philbin would refuse to can the OC if told by Ross to do so. Or perhaps Sherman would see the writing on the wall and walk away to help his friend? Philbin didn’t pull a Mike Munchak, who was fired as Tennessee Titans coach after reportedly refusing to make changes to the coaching staff. Early names mentioned as possible OCs include Green Bay Packers quarterbacks coach Ben McAdoo, former Cleveland Browns head coach Rob Chudzinski and former Houston Texans head coach Gary Kubiak. Quarterback Ryan Tannehill, in his second year after playing for Sherman at Texas A&M, reportedly lost confidence in the coordinator late in the season. Whoever replaces Sherman will be expected to help Tannehill develop into a franchise QB and find a way to better utilize the receiving skills of Wallace. But the team (Ireland) better plug holes on the line and also find a running back, or next year’s offensive coordinator, Philbin and Ireland likely all will be looking for work a year from now.